A warming station has been set up at First Congregational Church in Battle Creek. Some homeless find a quiet place for a nap during the brutal cold snap. Dinner is served at the Salvation Army in Battle Creek. Creating a meal at the Salvation Army in Battle Creek. Daniel Jones, Executive Director for the Haven of Rest Ministries in Battle Creek. Nicole DuPont, Operations Lead for the county’s Coordinating Council, which oversees the Point In Time Count. After the sun sets, the homeless population in Calhoun County comes out of the shadows as a light is shined on them Wednesday, Feb. 6. This is when an annual count is scheduled to begin that will help develop a clearer picture of the true scope of the county’s homeless situation as a way to secure additional funding to address the needs of a population that tends to favor invisibility for a variety of reasons. The annual effort, known as the Point In Time (PIT) Count, is mandated by the Department of Housing and Urban Development as a way to get a snapshot of the nation’s homeless population through information gathered from counties throughout the United States. The information compiled is used by the community and local, state, and federal governments as they make plans to end homelessness, says Nicole DuPont, Operations Lead for the county’s Coordinating Council, which oversees the Point In Time Count. Current estimates put the number of homeless individuals in Calhoun County at 1,199 of the county's total population of 134,128. Those with no homes live on the street, in emergency shelters, or in places not fit for human habitation, DuPont says. Of particular concern is a 7 percent increase in homelessness, mainly in families with children and veterans, that the county experienced between 2015 and 2017. Daniel Jones, Executive Director for the Haven of Rest Ministries in Battle Creek, says the Haven’s family shelter is very full and represents the most actively growing part of the agency’s client population. He says he’s also seeing an increase in the number of single fathers with children because the mom may be dealing with issues such as substance abuse. Jones says about 85 percent of the Haven’s clients come from immediate zip code areas with the remainder coming from areas such as Chicago or Detroit who find themselves in Battle Creek for various reasons. He says there is no priority given to those who live in the city or county over those who come from outside the area. The Haven is the county’s only active emergency homeless shelter. The other shelters are the SHARE Center, a drop-in center open during the day, and Safe Place, a shelter for victims of domestic abuse. “We are desperately underfunded for the population we serve,” DuPont says. She says the loss of a job, substance abuse, or unforeseen expenses such as a health crisis or housing issue are among the reasons for the spike. The Haven has a total of 145 beds located in its women and children’s shelter – Inasmuch House – and its men’s shelter. Some 18 beds in an area separate from the men’s shelter are specifically for homeless veterans and there are about four beds to serve men with mental challenges. The Haven aslo offers a substance abuse prevention program on an in-patient basis for men and an outpatient basis for women. 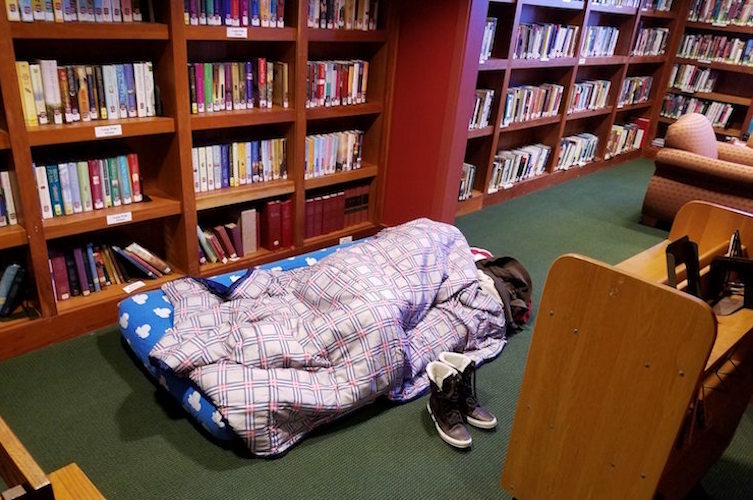 The recent wave of brutally cold temperatures and snow gripping Michigan has brought in a steady flow of homeless individuals who are sleeping on mats that augment the number of beds available. These are individuals who are adept at hunkering down under bridges or in massive hunting tents with wood burners, Kerr says. While there has never been a time when space to house the area’s homeless has run out if that time did come, Kerr says there are vouchers available to families to stay in a hotel. In 2015, the county’s homeless population was 1,116. That number has since increased by 83. Even though the county has the data to document an increase, it has seen only incremental increases in state and federal funding since the Point In Time Count began 13 years ago and actually saw a decrease of about $50,000 in last year’s state funding because of budget shortfalls, according to DuPont. “We get about $300,000 from HUD and about $120,000 from the state annually. We are one of the lowest-funded Continuum of Care’s in the State of Michigan,” DuPont says. The dangerous weather conditions pushed the Point In Time Count from its original Jan. 30 start date to the following Wednesday. The search for the county’s homeless begins at sunset on Feb. 6 and ends at sunrise on Feb. 7. During this time teams of volunteers and outreach specialists will be on the streets and in areas where homeless populations are believed to be congregating, offering supplies, information about shelters and resources available to them. In addition to the street count, a service count will be done through meals that will be provided at the SHARE Center, a daytime shelter managed by Summit Pointe, the county’s housing resource agency; the Emmett Street Missionary Church; and the Salvation Army. DuPont says volunteers and outreach specialists have already been out and talking to homeless individuals about the meals in hopes of getting them in and counted. The first meal will be dinners at the SHARE Center and Emmett Street where people will be asked if they have a place to sleep that night or if they are going to seek shelter in uninhabitable spaces. A breakfast at the SHARE Center and a lunch at the Salvation Army will take place the next day to capture information and take a count of those individuals who weren’t at the other two meals. As part of the Count, forms are distributed to individuals and families to fill out and then collected. The information gleaned gives DuPont and her team more accurate information about individual situations and demographics. “Through this critical information, we are able to determine the scope of need and target resources,” DuPont says. 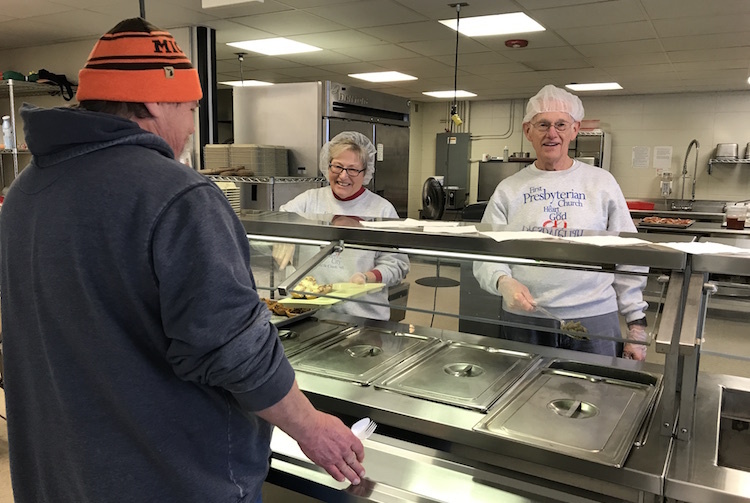 Dinner is served at the Salvation Army in Battle Creek.Calhoun and Kalamazoo counties are among seven in a HUD-designated area called Region 8 that are sharing $300,000 provided by HUD to conduct the county-specific PIT Count. Teams from Kalamazoo County have been in Calhoun County since October distributing hygiene kits and meal kits to people at identified homeless camp locations. Tyrone Thrash, who works for the KCMH Housing Department and is lead Street Outreach, says it’s sometimes not easy to convince the homeless to take advantage of services available to them. Ongoing outreach efforts are funded through Projects Advancing Transition for the Homeless, a federally-funded project through Community Mental Health Services and the Department of Health and Human Services. Part of the outreach involves connecting the homeless to immediate services they may need, such as replacing lost I.D. information or social security cards, expediting social security applications if they have a disability that qualifies them to be on disability payments, or finding employment opportunities. Thrash says a staff of six, working with AmeriCorps workers, are responsible for this outreach in the seven counties that make up Region 8: Berrien, Branch, Calhoun, Cass, Kalamazoo, St. Joseph, and Van Buren. “We find that individuals are still living in tents in this weather,” Thrash says. “We have noticed more families that are basically camping out and that’s a scary thing as well. When local officials to move the camps and the individuals outreach is further complicated. After a camp is broken down it is necessary to re-establish trust and relationships. DuPont says it's not unusual for these camps to encroach on a neighborhood or wooded area by a park. Teams from Kalamazoo are in Calhoun County on a weekly basis to locate individuals and offer resources in addition to getting them off of the streets and into shelters. DuPont says the Haven recently hired a part-time outreach specialist to assist. Thrash, who has been doing this work for 17 years, says the causes of homelessness are many--mental illness exacerbated by failing to take medications; substance abuse; poor money management; and evictions related to the manufacture of methamphetamines are among them. But, he also cites a current economic climate that is leaving many people behind. “The way our economy is going, a lot of people are one paycheck away from being homeless and now with the governmental shutdown, there’s a lot of uncertainty out there,” he says. A lack of affordable housing adds to the uncertainty. Jones says the demolition of houses and apartments in the city because of fire or mold issues has decimated available affordable housing stock. Understanding the reasons why people become homeless is critical to the accessing of those who would otherwise not seek services, as well as giving organizations focused on homeless issues the opportunity to reach out and offer services/resources that are available, DuPont says. “Most importantly, it is an opportunity to establish trust and help our most vulnerable population,” she says.